Discover in this EBook: Many people in the ancient world saw human life as deeply connected with the great cycles of nature: the rising and setting of the sun, the changing of the seasons, the death and rebirth of vegetation. In the same way that other patterns in nature repeat at regular intervals, they believed that human history also goes through cycles in which significant events repeat, and are likely to happen again in the future at predictable times. A penetrating study into the history of astrology, ancient religion, secret societies and the evolution of consciousness, 2012 and the Shift of Ages: A Guide to the End of the World is sure to be an invaluable resource in navigating a time of difficult transitions. 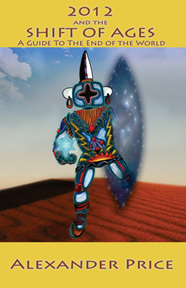 Chapters include: Opening the Sacred Hoop; Entering the Fourth Cycle; The Beginning of the End; Myths of the Aztecs; Time in the Aztec Worldview; The End of the Aztec World; Hopi Prophecy and Mysticism; Earth Changes; Pole Shift; Hollow Earth; The Shadow Government; Armageddon; Dimensional Shift; Becoming Quetzalcoatl; Remember the Ancestors; more. Downloads instantly! New Low Price! 2012 AND THE SHIFT OF AGES: A Guide to the End of the World By Alexander Price. 224 pages. Illustrated. EBook. Illustrated. References.